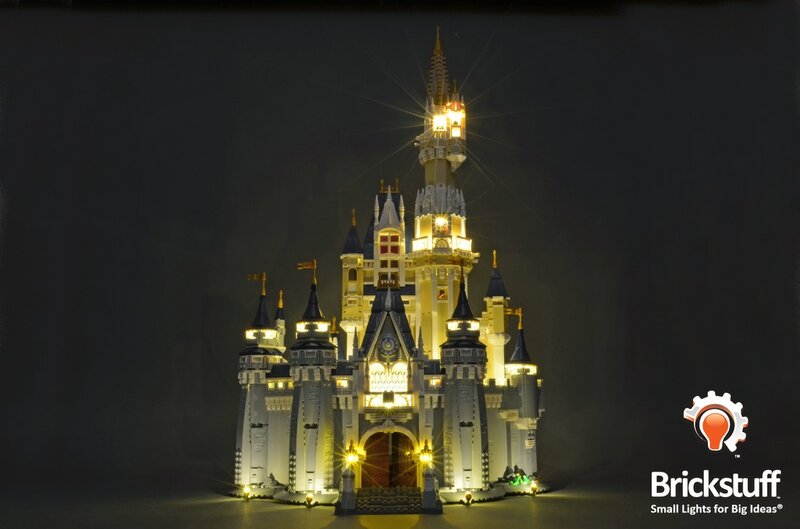 LEGO Disney Castle Ultimate Lighting Collection - Brickstuff-- Small Lights for Big Ideas! Now With Free Worldwide Shipping on Qualified Orders! ​When LEGO® released its magnificent version of the famous Disney Castle in September 2016, we knew this one-of-a-kind model deserved a range of lighting kits that truly brought it to life. After more than six months of development, in early 2017 we launched a complete range of lighting kits for this beautiful model, all developed with close input from fans, and each offering unique options for lighting this amazing model. Almost two years later, we have shipped hundreds of kits to customers around the world. ​The sections below describe each kit in detail, and there is a link at the bottom of this page to pre-order the kit(s) you'd like to reserve for your castle. We will be releasing the kits in waves, so if you try to order and a kit is out of stock, check back soon-- we expect to be adding stock on a regular basis. PLEASE NOTE: we are taking pre-orders for our June 2019 batch of kits at this time. Orders are expected to begin shipping on or around June 28, 2019. The interior lighting kit includes all lights shown above, plus an infrared remote control that turns everything on and off. The IR remote can also be used to control the flickering intensity of the chandelier and torches. ​The price for the interior lighting kit is $172.99. The exterior lighting kit includes all lights shown above, plus an infrared remote control that turns everything on and off. The IR remote can also be used to control the flickering intensity of the two torches at the front entrance. Based on fan feedback, we have also lit the front clock and decorative panel. The exterior lighting kit includes a set of eight warm white spot lights and a set of eight color-changing spot lights. You can toggle between the warm white lights and color-changing lights using the included remote control. Unique to our kit is the ability for you to select the color of the exterior lights and the cycling speed of the color-cycling mode. This is easy to set using the dial mounted on the color-changing lighting controller that is included with this kit. Note that the upper and lower color-changing lights are synchronized. If you would like to control the upper and lower color-changing lights independently, you can add a 2nd color-changing controller as an add-on (see below). 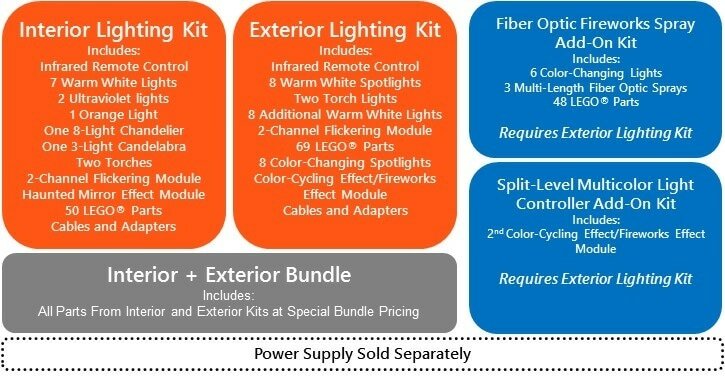 ​The price for the exterior lighting kit is $169.99. Based on customer input, we are offering a special bundle price for both the interior and exterior lighting kits: $299.99. ​Color-Changing Fiber Optic Fireworks Add-on Kit: $44.99. This kit provides three fiber optic spray assemblies with a total of six additional color-changing lights. The sprays can easily be mounted at the back of the castle without modification to the structure, then quickly removed for daytime viewing of the castle. The Split-Level Multicolor Light Controller Add-On Kit: $25.99. This kit includes a second Color-Cycling Effect Module, which allows you to have your upper color-changing lights and your lower color-changing lights on two different controllers. This means you can have upper and lower set to different static colors, upper set to a static color and lower color-cycling, lower set to a static color and upper color-cycling, or both upper and lower color-cycling but set to different speeds. This add-on gives you the ultimate in flexibility and control for your exterior lights. As outlined above, we are accepting PRE-ORDERS for our June 2019 batch of kits. This means that you can purchase the kits you would like for your castle, and we will ship them beginning on or around June 28, 2019 in the order in which they are received and paid. This does not mean your kit will ship on June 28, but rather that we expect to begin shipping on or around that date. Due to large demand, we expect shipping dates may extend into mid May. You will receive a confirmation e-mail once your order is placed, and another e-mail when your order has shipped. You may cancel your order any time before it is shipped by sending us an e-mail through our Contact page. 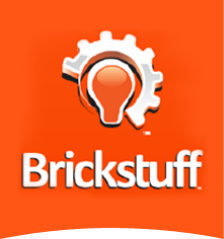 If you have questions, please post them on our User Forum. ​Also, when ordering your kits, please also remember to add a power supply. You will need one power supply per castle-- not one per lighting kit. If you will be locating your castle within 3ft of a power outlet, we recommend ordering our USB Power Source-- this works with any standard iPad/iPhone type wall charger to power your lights. You can also use our 3AA Battery Pack or Power Functions Power Source to power your castle lights. Ready to place your pre-order? Click here to be redirected to the order page. ​Thank you for your support, feedback, and ideas as we worked hard to create the best range of lighting kits possible!